A story in suburban Maryland's Gazette newspaper tells about Oneness-Family School's efforts to help Amman Imman bring water to the Azawak in Students at Chevy Chase school work for water a world away, by Peggy McEwan. Confessions of a Montessori Mom a blog by a stay-at-home, work-at-home, Montessori-trained teacher mom encourages readers to support the Montessori Amman Imman project and links to this blog. Global Voices, a non-profit citizen's media project out of Harvard University, highlights Amman Imman in an article about how World Water Day Ripples Across Videos. Author Voice for Peace on the progressive Democratic Underground website responds to a discussion entitled Imagine walking 3 hours for a glass of water with a post about the beautiful people of the Azawak of Niger in Children walk up to 30 miles a day for water - Amman Imman Water Project. Blogger K.K. in D.C. writes about today's Run for Water in Run for Water this Saturday, in which runners are running a grand total of 80 miles in a relay around Washington D.C. on World Water Day. Several websites list events happening on World Water Day 2008 compiled by Water Advocates. Run for Water is included among them with a link to the Amman Imman website. 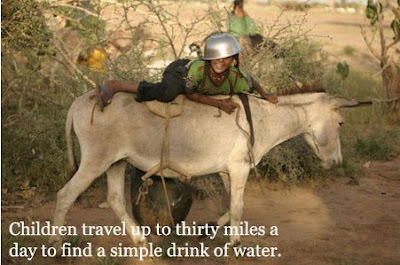 Here is one of the websites listing Run for Water under events on Washington D.C.